Hi there, I’m really happy to see that a number of you are interested in trying out this 2 in 1 sock knitting I talked about yesterday and I hope those of you who have not yet left a comment on yesterdays post, will do so before Tuesday 3rd of March evening and so be part of the draw on Wednesday to win some of my hand dyed yarn to knit your own pair of 2 in 1 socks. I used the Two Socks in One pattern by Kate Atherley on Ravelry but if you have a different pattern you would like to try then that is fine as well. I’ve tried to search online for another pattern using this technique and so far have not found any. If you know of other sock patterns using this technique I’d love for you to shear them with us here in the comments section. However, before knitting the 2 in 1 socks with my yarn I do recommend that you knit the training version first using a dk or worsted weight yarn in 2 different colours. That will help you understand the construction and the technique so more easily. And just as an incentive, to encourage you to try out this fun technique and leave a comment on yesterdays post to enter into the giveaway draw and maybe win some of my yarn to knit your own pair of 2 in 1 socks, here are pictures of the yarn I dyed for myself to use for my first “real” pair and if you are lucky you will win the same yarn:) I used my glitter base that I love, it’s 75% superwash merino, 20% nylon and 5% silver stellina. 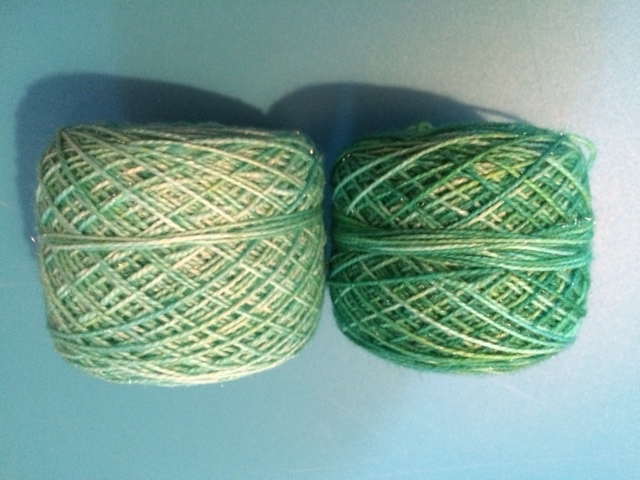 I dyed the yarn in Emerald Green. 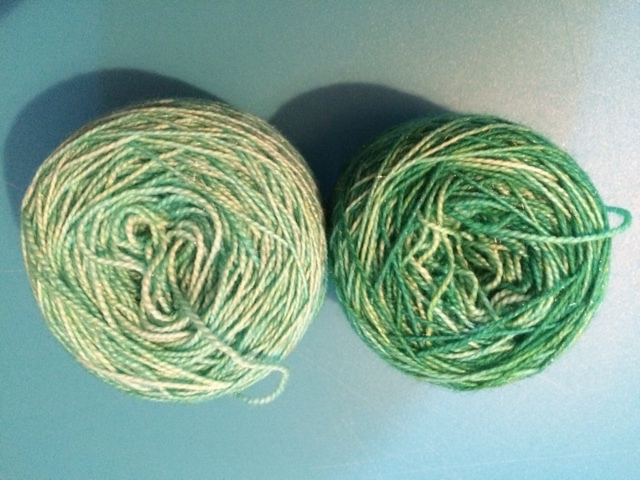 One yarn cake is light emerald and the other is darker and has a varigated/gradient look to it. This way it is easy to tell which is Y1 and which is Y2 and yet your socks are not total opposites colorwise. Unfortunately the stellina thread does not show up well on the pictures but I assure you it really gives a beautiful sparkle that enhances the colour of the yarn. « Two in One socks – have you ever tried this?